You might have read the blog post on a large-enterprise healthcare company that described PrinterLogic as "amazing" after its remote server infrastructure shrank by 70% and its printer downtime was slashed by 30%. You might also have read the post about a group of healthcare companies that saw a 70% drop in the amount of time spent on print management after installing PrinterLogic. And before that, maybe you read the post about an S&P 500 healthcare company that enthusiastically praised PrinterLogic’s centralized management after experiencing a 70% reduction in print-related calls to the service desk. Well, the independent research firm TechValidate is back with even more outstanding results from the healthcare industry. And it ought to make anyone think twice before buying another print server in the hopes that it will solve their enterprise print management woes. 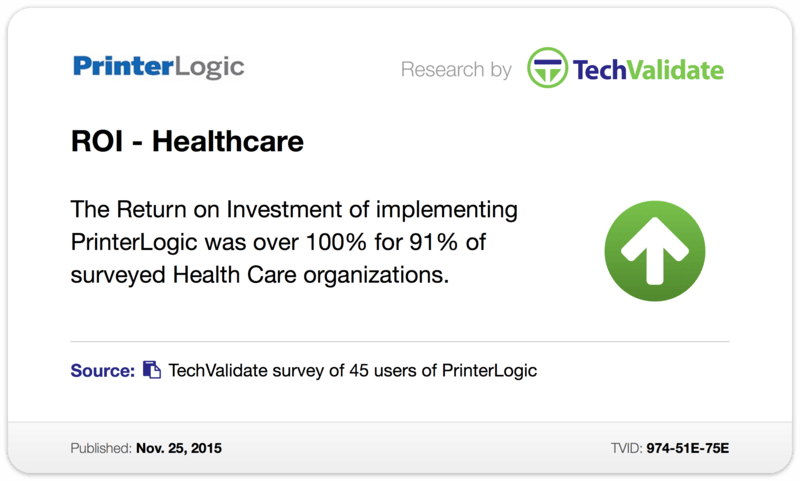 Based on a recent study of 45 verified PrinterLogic customers, TechValidate found that the return on investment (ROI) after implementing PrinterLogic was more than 100% for 91% of the healthcare organizations surveyed (TVID: 974-51E-75E ). That means 41 of these companies recouped their investment in PrinterLogic entirely, with many going on to see even greater ROI. The S&P 500 healthcare company mentioned above, for example, saw ROI of more than 200%, which isn't uncommon among PrinterLogic customers from all industries, including government, manufacturing, construction and financial services. 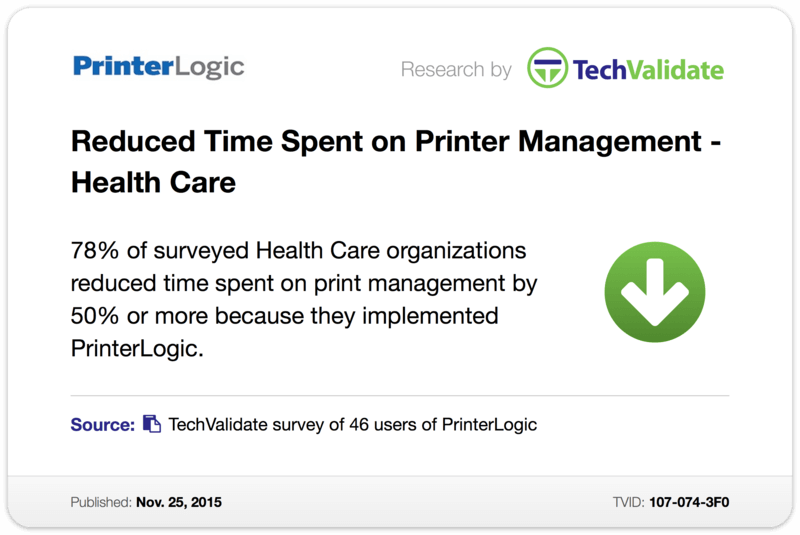 In a similar study—this time of 46 verified PrinterLogic customers in the healthcare industry—TechValidate discovered that 78% of the organizations reduced time spent on print management by 50% or more after implementing PrinterLogic (TVID: 107-074-3F0 ). In other words, for every two hours they were spending on print management prior to deploying PrinterLogic enterprise-wide, more than three-quarters of these healthcare organizations now only have to spend one—or even less. That might not sound like a lot when you're talking single digits, but in the aggregate over weeks, months and years, those hours add up to considerable cost savings that help explain the amazing ROI results above. We think real-world results like these are a fantastic way to showcase the benefits of PrinterLogic. Sure, we could (and do) talk about PrinterLogic’s incredibly easy but powerful centralized management, its ability to empower end users through an intuitive self-service portal that puts printer installation within everyone’s reach, or its auditing and mobile/BYOD printing capabilities that bring increased oversight along with next-generation flexibility—but those words mean so much more when they're backed up with numbers. And to get honest numbers like these, it takes a robust, innovative print management solution that lives up to its claims. Contact us today for a free trial or demo and see how PrinterLogic can help your company achieve these same results.